There’s a brief moment toward the beginning of this film in which Jim (Mark Duplass) and Amanda (Sarah Paulson) see each other at a grocery store. Individually they stop to notice the other, but each has to take a moment to decide whether or not they really want to do something about it. If you’ve ever run into an old high school friend unexpectedly, you’ve likely had a similar moment (admittedly I’ve let many of these moments pass me by). Though for Amanda and Jim it’s even harder because they used to be high school sweethearts. In that moment we realize the acknowledgment of each other’s presence would inevitably change the course of the night for both of them emotionally whether they end up spending time together or not. But of course, spend time together they must. Yet even if it’s clear these people know each other, there’s still the awkwardness of people hoping to make a good impression. Inevitably when you see an ex (or anyone you knew in the past) after a long time away you want to appear at your best. Duplass, in particular, does a good job of appearing truly shaken after their initial greeting. Amanda can sense, as we can, Jim’s underlying sadness somehow simultaneously softened and heightened by her presence. She agrees to go on a tour of sorts visiting the relics of a time long gone. The first stop is for coffee at a diner called The Blue Jay where they catch up on where life has taken them since they knew each other. He moved to Tucson where he works in construction for his uncle, but he’s back temporarily because his mother recently passed away. It’s fallen to him to fix up and sell her house - the one he grew up in. Amanda, on the other hand, seems to have an almost idyllic life with a husband and kids. They aren’t her kids, but when you marry a man who already has kids you become a mother whether you’re ready or not. She’s just in town to take care of her pregnant sister for a while. Though she takes a while to admit it, it’s clear her situation isn’t exactly as idyllic as she initially made it out to be. In fact, one of the strong points about this film is Duplass and Paulson’s ability to play emotional complexity with more than their words. Even if this film only contains two characters talking to each other - a growing genre I find myself increasingly drawn to - it’s remarkable for what they express without words. The way in which Duplass’s voice shakes in moments when he’s forced to explore the harder details shows the sort of range not many know he has. His Jim is a more layered version of the stereotypical indie movie sadsack. He is fun and charming, and instead of a straight faced man with bottled up emotions, he’s frequently fighting back tears that hint at a deeper emotional pain. Both Duplass and Paulson give such strong, natural performances they’re able to express their fond memories of each other, along with all the emotional complexity they entail, simply with looks. Next their tour takes them to a small shop they frequented in high school. They’re shocked to find the same old man, who looked a hundred years old back then, still tending the counter. Just for fun they decide to grab a six pack of beer full of random imports in order to take a “tour around the world.” This is the sort of spontaneity they clearly bring out in each other and that has been all too lacking in their lives recently. Eventually she asks him to show her his mother’s old house. It’s a time capsule for both of them. They find the old clothes he used to wear in high school, some of which she borrowed from time to time. She also tries to mock his old journal until she finds she's still moved by his descriptions of her. They find a box of old cassette recordings they made together. One in particular had them pretending to celebrate some far off anniversary. Sitting there in a future in which they’re approximately the age they were pretending to be, ends up being a device with which to break down any walls they might have been hiding behind. It frees them to attempt to relive their dorky, spontaneous youth by pretending to be the married couple they imagined so long ago. It reminded me of a scene in Wong Kar Wai’s In The Mood For Love in which two people being cheated on spend time together pretending to be each other’s significant other since theirs is never around. The difference here is Jim and Amanda don’t need the practice. They’ve been together before. If they’d stayed together it would have been about the same anniversary they pretended to have on tape. So they get caught up in the moment. She makes him dinner and he pretends to come home from work. They dance and sing along to an old song they remembered listening to. These scenes give Duplass and Paulson a chance to utilize their adlib acting chops. They’re funny, charming, and fun to be around. Nostalgia hangs in the air for these people, not simply because they’ve returned to the place of their youth, but because they’re revisiting it together. The developmental years of our youth are often the years we look back on with the most fondness. It’s not surprising then that the people we associate with those years are the ones we share the most fondness for. She feels comfortable admitting things about herself to him that she doesn’t admit even to her husband. All of this begs the question of what went wrong. Yet Duplass, who wrote the script, withholds that information until the film’s climax. But when it does come up it packs an undeniable emotional gut punch, in part because of what it is (which I won’t spoil), but also because of the night we spent getting to know how good things were and could have been. The gut punch also works because we know these are honest reflections of people. How many happy couples have broken up for avoidable reasons. By the time they realize it, it’s likely too late to alter course. When films like this work, they do so because they offer a bittersweet reflection of the people we know, or ourselves, or who we might have been. It’s a poignant film that worked on me, likely in part because of my fondness for these sorts of films. They don’t all work, but this one does largely for its performances, its relatable subject and Julian Wass’s ethereal soundtrack. 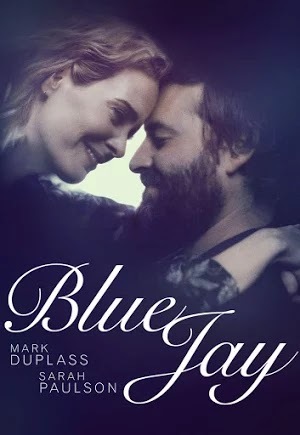 Blue Jay is the first film Duplass made in his new deal with Netflix. It is currently in limited release and streaming via VOD, but will get a Netflix release this December.